The lungs are remarkable. They should be cared for. What we eat may not directly affect the lungs, but our food indirectly touches them through the cardiovascular system and by providing antioxidant protection. A high fat diet has also been linked to a higher risk of developing lung cancer. On the other hand, eating fruits has been shown to lower these risks. 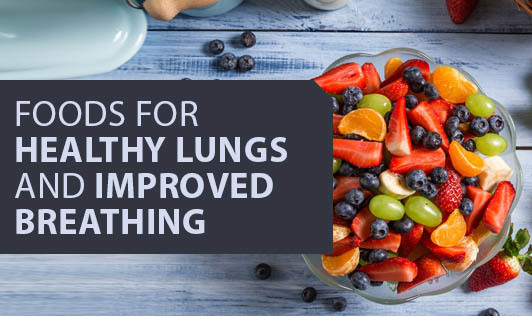 Eating well goes hand in hand with exercise in keeping your lungs clear, healthy, and not overburdened. Fresh, raw foods are the best way to get the enzymes, vitamins, minerals, and antioxidants that will keep you breathing easy. Cruciferous Vegetables – Cabbage, cauliflower, broccoli, and kale have been shown to halt the progression of lung cancer and cut the risk of developing lung cancer in half. They are rich in chlorophyll that cleans and builds blood components and are full of effective antioxidants. Apples – Flavonoids and vitamin E and C also help the lungs function at their best. Apples are rich in all of these and those who eat several a week have healthier lungs. Carrots – These roots are rich in vitamin A and C, and lycopene, all antioxidants that affect lung health and lower the chances of developing lung disease. Oranges – The citrus fruits are rich in vitamin C and B6. These help the lungs transfer oxygen.